You have to love National’s Pakuranga MP Maurice Williamson. Maurice just can’t help but tell the truth, in his enthusiasm for the latest right-wing plan. Indirect tolls – the state pays with your taxes for each time the tracking device in your car goes onto a toll road. Either way, we taxpayers pay for it. Question is – who do we pay? PPPs are the worst form of privatisation! Traditional privatisation involves the state selling off all or part of the ownership in a state asset or operation. PPPs take several forms, but usually involve the BOOT model – the state ‘Buys’ construction of an asset, ‘Owns’ the asset, but lets a private company ‘Operate’ the asset (normally for 30 years -the useful economic life of most infrastructure assets), before the private company transfers the run-down asset back to state ownership, so it can be expensively rebuilt ready to start the cycle of fleecing the public purse again. Overseas experience shows these PPPs are a disgraceful ripoff of public money. Reality is, the public invest all the capital and take all the risk, while a Private ‘shell’ company takes all the profit off the public, and laughs all the way to the bank, leaving the public to rebuild knackered assets. To understand in a NZ context, think of our national rail system. ‘Normally’ privatised by National in 1993, owners Tranz Rail asset stripped and bled dry the network, while investing nothing in developing the business – many services were stopped under their incompetent mismanagement. Late owners Toll did not improve things, before the state bought it back in 2004. If NZ Rail had been PPPed, the state would have retained ownership, but given Tranz Rail a 30year contract to run the rail. As part of ‘running’ the rail system, Tranz Rail would still have stripped and sold tracks for scrap steel, sold and leased back the Cook Strait ferries, etc, and paid out these ‘savings’ as dividends to the operator (Tranz Rail), and the public would still have had to invest $200m (and climbing) in rebuilding the track after we got frustrated enough with Tranz Rail’s failed operations to buy it back. But, Tranz Rail would not have needed to invest the $300m capital that they initially bought NZ Rail for. This allows them to invest that cash elesewhere and make bigger profits. And with 20 years left on their operation contract, Tranz Rail would have been able to charge the state for buying out this contract (which based on their initial asset-stripping fueled profits, would have cost hundreds of millions). Nice – for Tranz Rai’ls owners. The worst part is – Labour are just as bad as National on all this. Dr Cullen has enthusiastically supported PPPs, and said they are inevitable! And will apply to existing roads, so thy cannot even claim it is just to help Labour build new roads – they want PPPs to let their capitalist cronies make a viable profit from toll roads. And none of this even considers the human rights considerations. Recall those tracking devices in your car? They are the best method the road tolling enthusiasts have come up with to prevent us having to physically stop and pay at toll booths, like we used to on Auckland’s harbour bridge. But of course they also offer the state – or worse, a private company – with the ability to surreptitiously track and moitor where people are. And that should give people even more shivers than they get from Google Earth trying to make maps with high resolution satellite images that show people going about their business. Effectively, it makes all of us inmates on a global form of home detention with electronic bracelets tracking us. None of this happens with straight state-owned, tax funded roads. Says it all really. A NZ Herald article on Aucklander’s concern over vanishing heritage structures has jolted me to mention my concern over one specific heritage aspect in Auckland province (i.e. entire urban Auckland area). 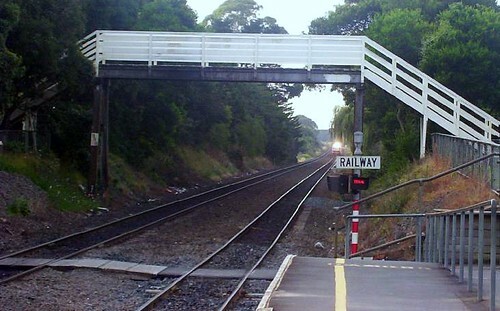 As part of the ‘upgrade’ of Auckland’s urban passenger rail services, Auckland Regional Transport Authority (ARTA) – a wholly owned subsidiary of Auckland Regional Council – has been steadily rebuilding rail stations and pedestrian overbridges in the region. Sadly, in doing so, the blinkered town planners & architects have been either removing the existing heritage buildings & bridges, or been destroying them. Recent examples include the removal of the 2-storey wooden signal box and bungalow style station building from Newmarket so a new, (supposedly) improved station layout could be built. Similarly, a (genuinely) better* pedestrian overbridge at Middlemore station in north Papatoetoe saw ARTA remove the old and still-strong and safe wooden overbridge. Far too many Kiwis ‘ooh’ and ‘aah’ at overseas heritage buildings and landscapes, without putting 2 and 2 together, and realising to get historic visitor attractions you have to actually preserve them from the knuckle-draggers with chainsaws and diggers. P.S. I heard Wellington rail network also had a footbridge removed a week ago. The march of the mindless concrete contractors continues. * Though better because it includes a disabled lift, the new Middlemore footbridge is uglier (subjectively), but also illustrates the idiocy of the ‘planners’ involved. Despite the obvious possibility of linking Middlemore hospital to one of their new multi-storey carparks across the tracks and over a small adjacent sideroad, the planners did not see fit to talk the Counties District Health Board into extending the overhead bridge so people could walk directly from carpark to station to hospital. A small 20m extension either side. Talk about short-sighted! Oh – my – stars!!! Even by the standards of stupidity that are the hallmark of capitalism, this is dumb! The mechanical moron on the end of the Veolia spy-cam and intercom just reflects the terrified attitude of staff under the conformity demanded by capitalist companies, though. It is notable that Veolia and Ontrack have never openly supported lobby groups working to get better rail funding. Is it any wonder they struggle to keep up with public demand for rail. Perhaps now ARC will see sense, and take over rail service provision in Auckland (even if as a CCO, like funding agency ARTA). That will cut the profits drained out of public funds by Veolia, and allow greater transparency and control of a public transport system in desperate need of it. My sympathies to Jon Reeves, who I know to be a friendly, hardworking advocate for rail. Veolia should pay him, not ban him. At least ARC chair Mike Lee is getting onto the idiots at Veolia – may he tear a few strips off. Better still, dock Veolia financially for abjectly failing on customer service standards (Reeves was a customer). And now Veolia & ARTA claim their staff mistook Mr Reeves for a fare dodger, yeh right! Credibility of this claim is NIL. First, wouldn’t the staff have mentioned the unpaid fare when Mr Reeves asked them what was going on via the emergency phone? Wouldn’t the fact that he talked to them on the phone, and showed his ticket to their CCTV camera have discounted this obviously false claim? Pathetic – Veolia should face financial penalty for this crass dishonesty, and involved ARTA staff should be given formal written warnings on their employment agreements. This shameful incident shows how out of touch Auckland rail agencies are, which explains why people like Jon Reeves are needed to lobby for improved rail. Left to themselves, ARTA and Veolia would do little more than an occassional extra train once every 5 years, which is useless. Time out in tunnel to Milford Sound? Now a rail tunnel to Milford Sound to replace the accident prone road route is basically a good idea, in my view, but they really need to rethink the idea of people staying in their cars stacked on flatbed rail wagons. Private cars have no way of signalling to train crew if some half-wit opens the door to admire the view of the tunnel walls rushing by inches away. Better to add a couple of carriages on at one end, and get all people in them. Also more comfortable, as they can move around, go to the toilet, etc. And if you don’t think anyone would be so dumb, recall the London student who stood up on the top floor of an open roof, double decker bus when it went under a bridge? No prizes for guessing who won…bridge or student? An isolated rail line is fiscally risky though (as the long closed isolated Nelson-Glenhope rail line proved in the 1950’s), and has higher upkeep, as parts and vehicles for maintenance have to be brought in on heavy load lorries. You have to ask if any thought has been given to rapidly extending such a line to Queenstown at least, to hook up with a possible future rail route from Invercargill or Dunedin. Rail lines used to exist from Invercargill to Kingston, but only the Kingston-Fairlight section remains for the tourist train Kingston Flyer. Similarly, the Central Otago Line used to run from Dunedin up to Clyde (for the Clyde dam hydro scheme construction), but is now truncated to Middlemarch from the Dunedin end, with the remainder of the line as the Otago Central Rail Trail horse riding-walking-cycling route. You are currently browsing the archives for the rail category.